Earlier this year, Google came under the spotlight when James Damore filed a lawsuit alleging that Google discriminated against white men and political conservatives. Now, another Google engineer Tim Chevalier has sued the company for firing him for pushing back against racism and sexism in the company’s internal employee forums. 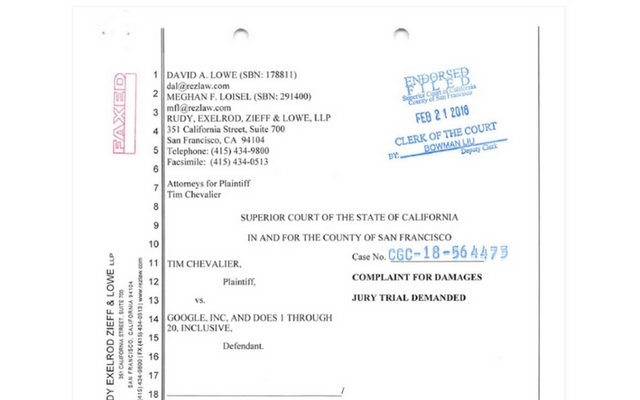 Tim Chevalier, who was a site reliability engineer, filed a lawsuit filed in San Francisco Superior Court, according to Gizmodo. He says he terminated for in November 2017 for defending women, people of color and LGBTQ employees from attacks on Google’s message boards. Chevalier alleges Google fired him instead of addressing the harassment and discrimination he was protesting. An important part of our culture is lively debate. But like any workplace, that doesn’t mean anything goes. All employees acknowledge our code of conduct and other workplace policies, under which promoting harmful stereotypes based on race or gender is prohibited. Google spokesperson Gina Scigliano told Verge said Google was only enforcing its company policy against stereotypes and letting them seep into everyday conversation with other employees. “This is a very standard expectation that most employers have of their employees. The overwhelming majority of our employees communicate in a way that is consistent with our policies. But when an employee does not, it is something we must take seriously. We always make our decision without any regard to the employee’s political views,” Scigliano said.